Even though I'm trying to make high mileage days in order to simplify catching my Reno flight, I decided to make today a relatively short riding day so I could spend the afternoon in the off-route city of Hutchinson, Kansas. Staying here appealed to me for three reasons. First, Hutchison has a bicycle store and I have been riding without a spare tube for several days. Second, the Zion Lutheran Church in town hosts a bicycle hostel, so I knew I would have a good place to stay for a reasonable price. Third, Hutchinson is home to the Kansas Cosmosphere, one of the premier space museums in the world. Bob and I left the Newton firehouse in the morning and headed west on US highway 50. Bob was leaning towards riding further than Hutchinson, but he decided to defer his final decision until having lunch in town. The riding in central Kansas is pretty easy, but I've been blessed with some pleasant weather to bicycle in. The terrain is mostly flat, with a gradual incline as one heads west towards the Rocky Mountains. I've been continuing to have crosswinds, but consider myself fortunate that I haven't had many winds I had to head directly into. The best thing about the weather has been all the rain clouds passing overhead keeping the days cool, lest the sun bake all the energy out of me. 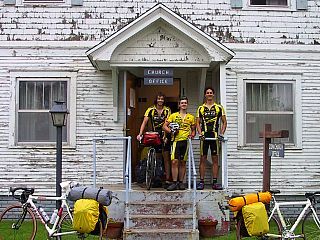 When we arrived in Hutchinson and got into the church hostel, we found that there were three other cyclists already there. Jonathon, Jonathon, and Winck are college friends who are spending the summer riding across the country for fun. They aren't following any particular route, but simply making it up as they go along. The three of them were all on the cycling team in their college and are riding lightly loaded bikes, which has allowed them to make pretty good time in their travels so far. They seemed like really good guys, and like they were having a lot of fun with their style of travel. After we all met at the hostel, we split up to spend our afternoons separately. 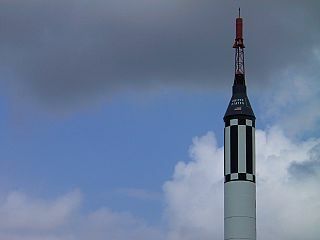 I spent hour after hour at the museum, studying their exhibits that spanned the development of rocketry and space hardware from the German work on the V-1 and V-2 all the way up to the International Space Station. I've been a space buff since I was a child, and it was thrilling for me to be able to look at the ill-fated Apollo 13 capsule, touch a soviet Vostok capsule that had orbited, and stand on a launch gantry that dozens of astronauts had passed through before being launched. Even though the stay in Hutchinson made this a short day, it was well worth going off-route to visit.